Sibiu ([siˈbiw], antiquated Sibiiu; German: Hermannstadt [ˈhɛʁmanʃtat], Transylvanian Saxon dialect: Härmeschtat, Hungarian: Nagyszeben [ˈnɒɟsɛbɛn]) is a city in Transylvania, Romania, with a population of 147,245. Located some 215 km (134 mi) north-west of Bucharest, the city straddles the Cibin River, a tributary of the river Olt. Now the capital of Sibiu County, between 1692 and 1791 and 1849–65 Sibiu was the capital of the Principality of Transylvania. 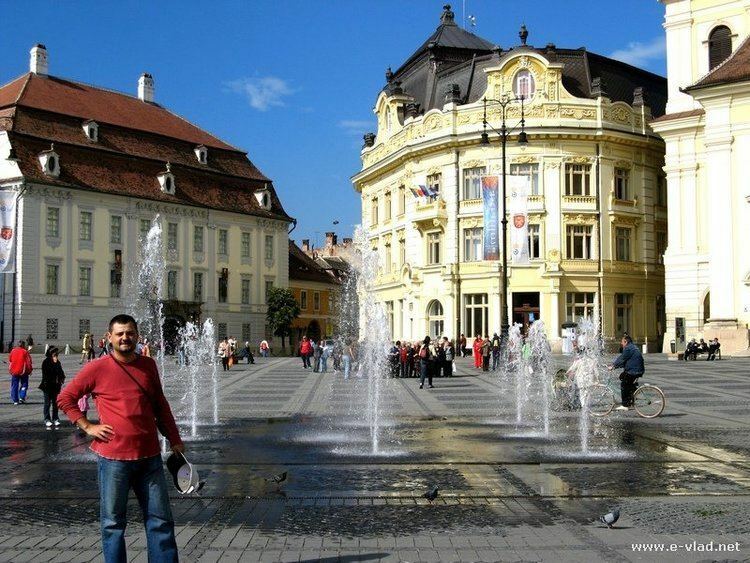 Sibiu is one of the most important cultural centres of Romania and was designated the European Capital of Culture for the year 2007, along with the city of Luxembourg. 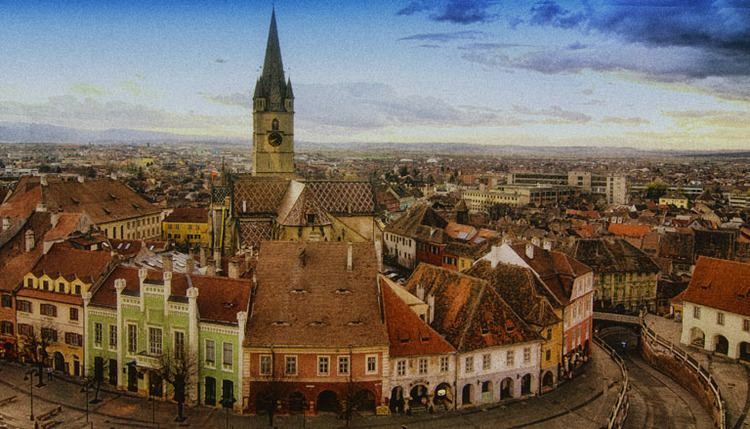 Formerly the centre of the Transylvanian Saxons, the old city of Sibiu was ranked as "Europe's 8th-most idyllic place to live" by Forbes in 2008. In the 14th century, it was already an important trade centre. In 1376, the craftsmen were divided in 19 guilds. 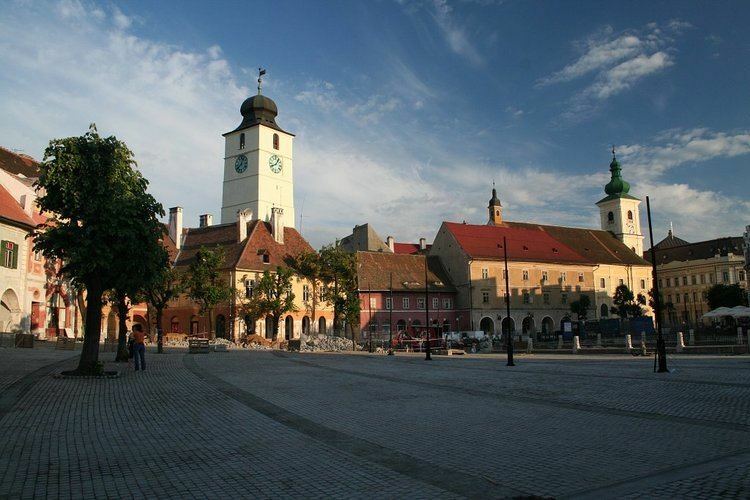 Sibiu became the most important ethnic German city among the seven cities that gave Transylvania its German name Siebenbürgen (literally seven citadels). It was home to the Universitas Saxorum (Community of the Saxons), a network of pedagogues, ministers, intellectuals, city officials, and councilmen of the German community forging an ordered legal corpus and political system in Transylvania since the 1400s. During the 18th and 19th centuries, the city became the second- and later the first-most important centre of Transylvanian Romanian ethnics. The first Romanian-owned bank had its headquarters here (The Albina Bank), as did the ASTRA (Transylvanian Association for Romanian Literature and Romanian's People Culture). After the Romanian Orthodox Church was granted status in the Habsburg Empire from the 1860s onwards, Sibiu became the Metropolitan seat, and the city is still regarded as the third-most important centre of the Romanian Orthodox Church. Between the Hungarian Revolution of 1848 and 1867 (the year of the Ausgleich), Sibiu was the meeting-place of the Transylvanian Diet, which had taken its most representative form after the Empire agreed to extend voting rights in the region. Sibiu is situated near the geographical center of Romania at 45.792784°N 24.152069°E﻿ / 45.792784; 24.152069. Set in the Cibin Depression, the city is about 20 km from the Făgăraș Mountains, 12 km from the Cibin Mountains, and about 15 km from the Lotrului Mountains, which border the depression in its southwestern section. The northern and eastern limits of Sibiu are formed by the Târnavelor Plateau, which descends to the Cibin Valley through Gușteriței Hill. Sibiu's climate is humid continental with average temperatures of 8 to 9 °C (46 to 48 °F). The average rainfall is 627 l/m2, and there are about 120 days of hard frost annually. Today, most of the population is of the Romanian Orthodox religion. Protestants and Roman Catholics represent about 5% of the population. Although ethnic Germans make up less than 2% of Sibiu's population, Klaus Johannis, the former president of the Democratic Forum of Germans in Romania (FDGR/DFDR) and current president of Romania, served as mayor of Sibiu from 2000 to 2014. When he was elected mayor in 2000, he was the first German mayor of a city in Romania since World War II. Johannis was overwhelmingly reelected in 2004 (with 88.7% of votes) and 2008 (with 83.3% of the votes cast) and his party gained an absolute majority in the city council in that year. The German Forum also won the elections for mayor in the second- and third-most important towns in Sibiu county, Mediaș and Cisnădie, as well as one third (11 out of 33) of the seats in the county council. The city also contains Romania's second-largest stock exchange, the Sibiu Stock Exchange. Sibiu is well served in terms of transport and infrastructure. In 2010 a city bypass was opened, significantly reducing the road traffic inside the city. Tursib is the city's internal transportation system operator. Sibiu has one of the most modern international airports in Romania, with direct connections to Germany, Austria, United Kingdom, Italy and Spain as well as to other Romanian cities. Sibiu is an important node in the European road network, being on two different European routes (E68 and E81). At a national level, Sibiu is located on three different main national roads, DN1, DN7 and DN14. The Romanian Motorway A1 will link the city with Pitești and the Romanian western border, near Arad. The remaining 161 km of motorway towards Arad, out of a total of 281 km, are under construction and expected to be completed by 2016, while the timeline for the segment towards Pitești is targeted for completion for the year 2020. Sibiu' s ring road as part of A1 motorway was completed on December 1, 2010. Sibiu is also an important hub for the international bus links with the biggest passenger transporter in Romania, Atlassib, based here. Transport companies are also providing coach connections from Sibiu to a large number of locations in Romania. Sibiu is situated on the CFR-Romanian Railways Main Line 200 (Brasov - Făgăraș - Sibiu - Simeria - Arad - Romanian Western Border) and on Line 206 (Sibiu - Mediaș). The city is served by five rail stations: the Main Station (Gara Mare), the Little Station (Gara Micǎ), Turnișor, Sibiu Triaj, Halta Ateliere Zonă . It has an important diesel-powered locomotives depot and a freight terminal. Numerous Inter City trains (nicknamed Blue Arrows) connect Sibiu to other major cities in Romania: Cluj-Napoca, Brașov, Craiova, Timișoara and Bucharest. Over the last six years, Sibiu has enjoyed a revival of cycling. The bicycle way in the city span for 43 kilometers. Bicycle rentals have offered a boost for the local economy with several small rental centers and a bigger rental center that is administered by the I'Velo Bike Sharing group. The ASTRA National Museum Complex focuses on ethnography, and consists of a Traditional Folk Civilisation Museum, a 96-hectare open-air museum located in Dumbrava Forest south of Sibiu, a Universal Ethnography Museum, a Museum of Transylvanian Civilisation and a Museum of Saxon Ethnography and Folk Art. Also planned is a Museum of the Culture and Civilisation of the Romany People. The Dumbrava Sibiului Natural Park stretches over 960 hectares and it is situated 4 km away from the center of the city in the southwest direction along the road towards Răşinari. Also, here you can find the Zoological Garden and Ethnography Museum. There is a Steam Locomotives Museum close to the railway station, sheltering around 40 locomotives, two of which are functional. The first park in the city was The Promenade, later called "The Disabled Promenade." established in 1791, today part of Parcul Cetății (Citadel Park). Current arrangement of the park, including the space between the walls, dates from 1928. The Sub Arini Park, established in 1856 is one of the biggest and best-maintained parks in Romania. There are other green spaces in the city center, the best known being Astra Park, established in 1879. Tineretului Park, Reconstrucției Park, Corneliu Coposu Park, Petöfi Sándor Park, Piața Cluj Park, Ștrand Park, Cristianului Park, Țițeica Park, Vasile Aaron Park, Lira Park. The distribution of green space is good compared to other Romanian cities. Several festivals are organised yearly in Sibiu, the most prestigious of them being the Sibiu International Theatre Festival, organized each spring at the end of May. Medieval Festival organized every year in August, reviving the medieval spirit of Transylvania. The Artmania Festival is held every Summer since 2006 and as of 2008 the Rockin' Transilvania Festival is also held in Sibiu. The oldest Jazz Festival in Romania is organized here, as well as the "Carl Filtsch" festival for young classical piano players, the "Astra Film" documentary film festival, the Transylvania calling Festival a Multi Cultural 6 day Open Air Music festival! 26–31 July 2007, a medieval arts festival and many more smaller cultural events. Feeric Fashion Week is also hosted here. The designation as a European Cultural Capital for 2007, owed greatly to the excellent collaboration with Luxembourg, but also to what many regard as a miraculous social rebirth taking place in the city during the last years. The Cultural Capital status was expected to bring about an abrupt increase in quantity and quality of cultural events in 2007. In 2007, Sibiu was the European Capital of Culture (together with Luxembourg). This was the most important cultural event that has ever happened in the city, and a great number of tourists came, both domestic and foreign. Since 2007, a traditional Christmas market is held for the first time in Sibiu, Romania. The first of its kind in Romania, it is inspired by Viennese Christmas markets, being a project developed by the Social Attaché of the Austrian Embassy in Romania, dr.h.c. Barbara Schöfnagel It was held in the "Lesser Square" (Piața Mică) with 38 small stalls, a small stage and an area dedicated to children, having several mechanical attractions installed there. Since 2008 the market is held in the "Grand Square" and grew to a number of about 70 stalls, a bigger stage was set up, where Christmas carols concerts are held. An ice skating rink and a children's workshop are also attractions which have been added in the following years. It was the first Christmas Market in Romania, but soon other Christmas markets emerged across the country. In 2013, the Sibiu Christmas markets was included in the "15 Of the Most Beautiful Christmas Markets in Europe"
(German: Unterstadt, Romanian: Orașul de jos) comprises the area between the river and the hill, and it developed around the earliest fortifications. The streets are long and quite wide for medieval city standards, with small city squares at places. The architecture is rather rustic: typically two-storey houses with tall roofs and gates opening passages to inner courts. (German: Großer Ring, Romanian: Piața Mare ) is, as its name suggests, the largest square of the city, and has been the center of the city since the 15th century. At 142 meters long and 93 meters wide, it is one of the largest ones in Transylvania. Brukenthal Palace, one of the most important Baroque monuments in Romania, lies on the north-western corner of the square. It was erected between 1777 and 1787 as the main residence for the Governor of Transylvania Samuel von Brukenthal. It houses the main part of the National Brukenthal Museum, opened in 1817, making it one of the oldest museums in the world. Next to the palace is the Blue House or Moringer House, an 18th-century Baroque house bearing the old coat of arms of Sibiu on its façade. Next to the Jesuit Church on the north side is the Council Tower, one of the city's symbols. This former fortification tower from the 13th century has been successively rebuilt over the years. The building nearby used to be the City Council's meeting place; beneath it lies an access way between the Grand Square and the Lesser Square. 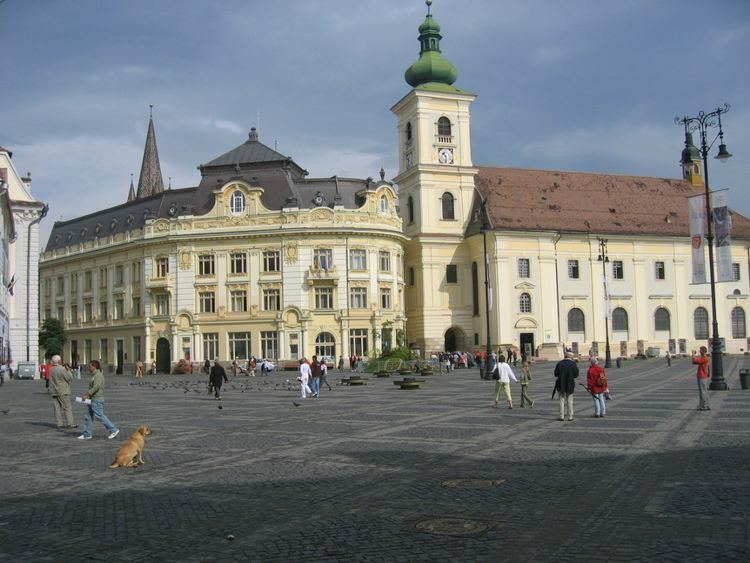 is the third of the three main squares of Sibiu. Its most notable feature is the Evangelical Lutheran Cathedral in its center. It is the place where the earliest fortifications have been built in the late 12th century or early 13th century. The buildings around this square are mainly Gothic. On the west side lies the Brukenthal Highschool, in place of a former 14th-century school. of Sibiu made the city one of the most important fortified cities in Central Europe. Multiple rings were built around the city, most of them out of clay bricks. The south-eastern fortifications are the best kept, and all three parallel lines are still visible. The first is an exterior earth mound, the second is a 10-meter-tall red brick wall, and the third line comprises towers linked by another 10-meter-tall wall. All structures are connected via a labyrinth of tunnels and passageways, designed to ensure transport between the city and lines of defense. The Passage of the Stairs, leads down to the lower section of Sibiu. It descends along some fortifications under the support arches. It is the most picturesque of the several passages linking the two sides of the old city. The city also houses one of the largest private hospitals in the country, Polisano. Sibiu is an important centre of higher education, with over 23,000 students in four public and private higher institutions. The Lucian Blaga University of Sibiu was founded in 1990, with five faculties: Engineering and Sciences; Language Sciences; History and Law; Medicine; Food and Textile Processing Technology. Nowadays, there are 10 faculties and departments. Sibiu also houses the Nicolae Bălcescu Land Forces Academy and the Military Foreign Language Center as well as two private universities, Romanian-German University and Alma Mater University. The city houses a municipal stadium, a multi-functional arena building, a rugby court, a municipal pool and several private tennis courts.